(Translation) Mariana Kaipper Ceratti, writing in El País: Combining the most up-to-date technologies with more traditional methods, thousands of farmers across Latin America are resisting drought, floods, and melting glaciers. Inacio Medeiros on his guava farm in Cruzeta, Brazil. Photo courtesy of El País (Spain). In the fictitious world of superheroes they would probably be known as Captain Seed, Super Water, and Super Snow, united in their titanic battle against the new villain besieging the Earth: Climate Change! In the real world, though, it would be more correct to call these characters the ‘super farmers’, a growing group of Latin American small farmers who are successfully employing technically advanced methods, along with more traditional ones, to counter the most extreme manifestations of climatic patterns – whether they be droughts, storms, or the loss of their sources of natural irrigation such as snowy peaks. And with good reason: the lives of some 93 million Latin Americans are dependent on agriculture, and in parts of the Caribbean this sector employs nearly three quarters of the rural population. Leaving aside their superhero names, these everyday champions of the Latin American countryside are making their presence known across many parts of the regional map, and their numbers are already in the thousands. The Brazilian Inacio Medeiros, for example, harvests thousands of kilograms of guava each month in one of the country’s most arid regions. Elsewhere, thousands of small farmers in Haiti are sowing seeds that are resistant to flooding. In Uruguay, entrepreneurs have created an ‘app’ which monitors climate, soil, and water conditions. And in Bolivia, locals are trying to use the water flowing from the melting snows of the Andes in as efficient a manner as possible. They are all initiatives which aim for a shared goal: to contribute to the adaptation of agriculture to the rise in global temperatures resulting from climate change. “The potential for damages to crops because of pests and diseases plus nonlinear temperature effects is likely to grow as the world warms toward 2°C and above”, according to the World Bank study Turn Down the Heat: Why a 4°C Warmer World Must be Avoided. This is a situation which would, beyond doubt, worsen in the context of a planet with an ever higher average temperature. It isn’t a case of turning agriculture into a highly sophisticated subject. On the contrary, at times it’s a simple case of going back to basics. 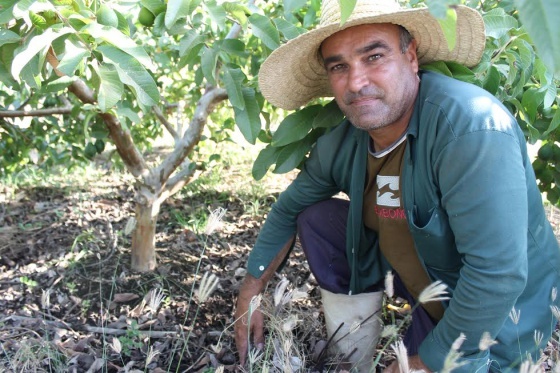 On his farm in Cruzeta (Rio Grande do Norte, Brazil), Medeiros only uses natural fertilisers and pesticides, as well as a watering system which calculates drop by drop exactly how much water his crops need. His lush guava trees deliver a yield of nearly 4,000 kilos of fruit each month. ‘Super Farmer’ is a popular Polish board game. But for Latin America’s rural and farming community, climate change is not just a game. However, it isn’t always so easy for a farmer to adapt to new situations. “The problem with climate change is a long-term one, whereas farmers’ needs are more immediate”, explains the agricultural economist Diego Arias, from the World Bank. “It takes time for farmers to feel the economic benefits of adapting [to climate change]. Throughout this period their incomes tend to fall, but they still need to support themselves and feed their children”, adds Arias, who worked for 10 years on agricultural projects in Haiti. Agriculture is responsible for 25% of Haiti’s GDP and 66% of jobs in rural parts of the country. In order to help 3,000 local farmers cope with this challenge, the World Bank is leading a project which gives them access to superseeds (which are more weather-resistant), supplies, and equipment. For one farmer, Denise Chery, this signalled an enormous change: floods are no longer such a worry for her, and she grows her produce using techniques which are more environmentally friendly. “In one year my produce has gone up by almost 30%”, she says. In the altiplano (Andean highlands stretching across Peru and Bolivia), thousands of metres up into the Andes, the challenge facing Bolivia’s farmers is a different one altogether: as a result of global warming, the melting of the Andean glaciers has accelerated. In a project coordinated by the World Bank and the NGO Care International, 155 families from the department of La Paz have begun using new irrigation systems which take advantage of water coming from snowmelt. This technology is just one part of a package of improvements brought to this community, which has also been given access to more resistant seeds and supplies which don’t harm the environment. Across other Latin American countries, one can highlight the example of Uruguay, where authorities are developing a National Agricultural Information System (SNIA – Sistema Nacional de Información Agropecuaria), a website which brings together weather forecasts and early warnings, monitoring of vegetation, soil and water, and which also generates simulation programmes modelling the impact the use of new technologies will have. Innovations such as these, which encourage adaptation to climate change, will become even more necessary over the coming years in Latin America, a region which in the medium term could become one of the most important sources of global food supplies. As far as Medeiros is concerned, small farmers like him have an essential role to play in a future such as this. “When we look after the earth, the earth looks after us”, he insists. Translation of Spanish original by Mariana Kaipper Ceratti for El País.